Do you ever browse Kijiji (or whatever is local for you). You know, just looking, just to see if there are any looms or spinning wheels or drum carders... Of course, you have no plans to buy - especially when the dh pops his head into the computer room and asks. "Whatcha looking at?" And I found something!!! A circa 1975 Thumbelina from New Zealand*. 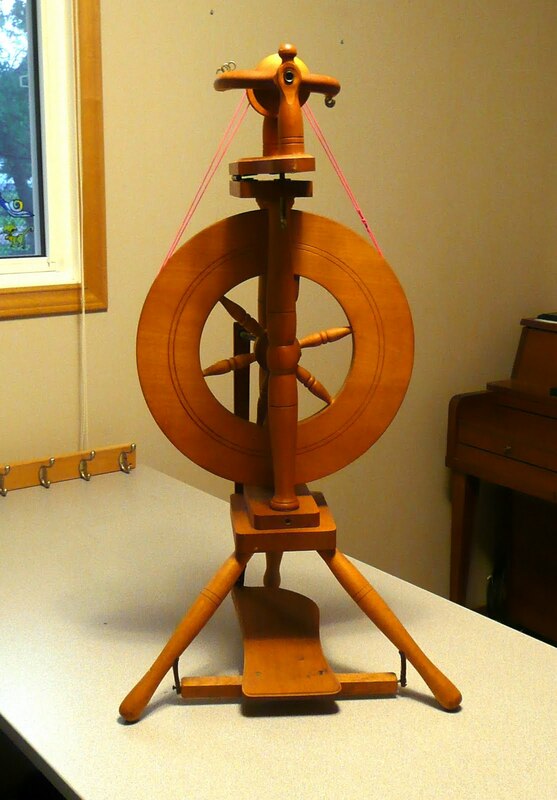 The seller was offering the wheel and 2 bobbins for $35. I almost burned the keys off my keyboard I typed the email in so fast. It just so happened that my brother was overnighting in a hotel very near the sellers home, so she offered to bring the wheel to the hotel (always wise to meet in a public place). And now I've got the cutest little wheel sitting in my living room. She spins like a dream. It doesn't appear to me that the wheel ever saw much use. 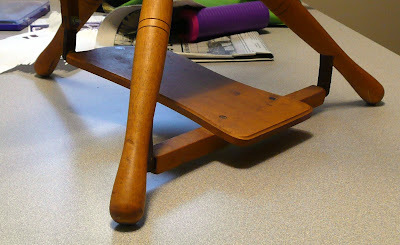 There are very few marks of any sort of wear, a few minor bumps and dings that you'd expect on any piece of furniture. I took it apart, oiled it, put it back together and promptly spun about 8oz. I hope my Ashford Traditional doesn't hear this, but I think I like the Thumbelina better! I don't need to treadle with nearly as much effort. My Traddy never feels effortless, and although I've made lots of yarn on her, it seems that there is a lot more resistance on her foot pedal, despite regular maintenance. Now the Thumbelina is no longer made, so I knew that getting additional bobbins would be tricky at best. But... my dad has a lathe, and has already shipped me some reproductions. I've got 2 originals and 3 reproductions that work very well. Should be able to make lots more yarn! So the moral of the story? Don't go looking if you don't want your living room to start filling up with fiber making furniture! *Check out this thorough resource on identifying New Zealand wheels. wow, what a score!! that spinning wheel and you must've been meant fo reach other. Hi, I love your story. Very Serendipity !!! I while learning first on a tradition ashford and then the "thumbelina", It was love at first spin!! My spinning instructor told me of a crafting center that was closing & I got a deal on a folding Lendrum which I do love but !! Later thinking I'd never find a Thumbelina, I found a Wee Peggy, also very nice!!! Terry also a Thumbelina lover!!! Then I found a Thumbelina, Yeah !!!! So I'm thrilled, but yes, my living room is fillng up !!! !